There is a sign that you are reading a good book … when you cannot put it down. I was not feeling well when I read this, I suffered from stomach flu and had been feeling weak for two days, couldn’t even had the energy to read. But when I received the ARC, once I started, I couldn’t put it down. I read it, while trying to get in a comfortable position in my bed, stomachache and all. I was so immersed with the life of Eddie “Cha-Cha” Vasquez and B. Andrew Daley, that I read all through it in a few hours. This is MY kind of book, people, and I LOVED every minute of it. Grime Doesn’t Pay dealt with several issues, not easy ones, I’d say. Let’s see, we have Eddie who suffered from dyslexia. Andrew, whose father was a hoarder. Andrew was worried that it was all in the genes, and the OCD that he had, that he couldn’t let go of a good book, was a sign that he could end up a hoarder like his father. Then there was another character, an ex-teacher of Eddie’s, who suffered from dementia. I mean, WOW, right? Imagine the drama! But interestingly, I thought Z.A. Maxfield was able to pull off the story without making me, as a reader, felt pity for the characters or overwhelmed with the problems. Instead, I loved how they dealt with it along with their friends and family. I loved each and every character, with their flaws and all. I thought Eddie and Andrew complemented each other. They had a beautiful chemistry and they overcame their differences with grace, even if there were arguments and slammed doors. 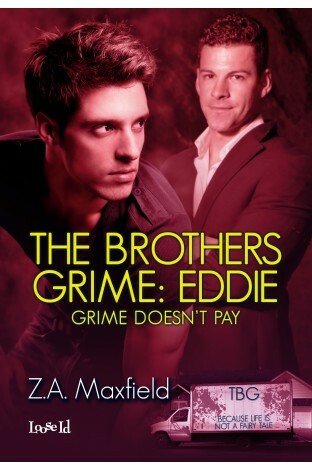 The part where Eddie and his brothers along with partners in The Brothers Grime helped Andrew clean his father’s house was the strongest scene of this book. It was really gripping in a down-to-earth kind of way, you know? You learned a lot about Andrew and his fear, about Reese (Andrew’s father) and his pain of losing his wife, in this scene. But at the same time, you also see how Eddie felt connected to Reese because they were both, ‘defective’. I could go on and on … but the main point is the story SPEAKS to ME. It is a story about imperfection. A story about life and its problems but written in a understated and realistic tone without having to add excessive angst or amount of sugar. It is the kind of story that touches me deeper and stays with me for a much longer time. If I had a complaint, which stopped me from giving this 5-stars, was the fact that when I thought about it, Eddie and Andrew were only together in a relationship for a week. Which meant it was sort of insta-love – not a thing I enjoy in any romance. My issue of course, others might think differently. I loved the first book in the series and ZAM’s writing in general. I am really looking forward to this one especially after reading your review. This entry was posted on November 26, 2013 by BioB in Contemporary, Reviewer: Ami and tagged 4.5 Stars, loose-id, za maxfield.